The Liberal Media? | brainsnorts inc.
reposted from about 3 years ago, but you’ve never read it. 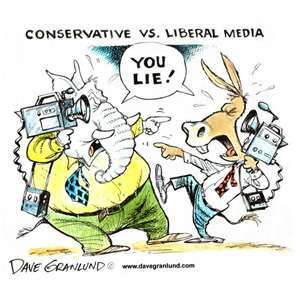 are the media on the left, sort of liberal in their attitudes? I’d have to admit, yes they are. however, are they automatically left, just because they think that liberal is the best way to be? hell no. let me explain that too. given that the media is more aware of everything that happens in this world than anyone else, then whose opinion would be more informed than anyone else’s? whose opinions are determined with a better awareness of the facts, a better understanding of the facts, and a better formulation of the facts because they are more aware of the facts than anyone else? yes, the answer again is “the media.” and i realize, without being blindly foolish, that there are times when the media has to pick and choose what they believe are the most relevant facts. i know they can’t present everything and must pick and choose at times. i also know that they need to get ratings. so, if the media are the most aware, most informed, and the most credible segment of society, then whose opinions, thoughts, and answers are probably formed with the best composition and understanding of reality? so, if the media has been determined to be the best informed segment of society, then i guess it makes total sense to accept most of the information from the “liberal” media – because who would know better? I’m not saying they’re 100% perfect 100% of the time. i’m just saying that I’m going to accept what they say, but i’ll follow up and wait until I have a reason not to accept what they say. I’ll still check out the facts to whatever degree i can, but i can at least believe they go forth with good intentions and not a liberal bias. I’m sure not going to trust the websites that my friend (nameless tim) keeps talking about. the sites that have definitive proof that Obama was born in Kenya, and definitive proof that trayvon martin had a gun but the liberal media won’t talk about it, and the sites that show how ufo’s are controlling Israel. okay, i made that last part up, but those other “facts” can be found on the same websites t hat advertise gunracks for pick up trucks and gunmen for hire. they might have some ted nugent concert tickets for sale too. Cheers to you on this one! Here’s a couple from my vault on the subject. those ten reasons cannot possibly be argued with. You really have a way of placing perspective and I enjoy it a lot. There has been so much muck tossing and you don’t toss any, how refreshing is that! I would also like to comment on your car…..That is a spectacular post I laughed so hard, my dog thought I was choking and offered to give me mouth to mouth. Your writing is excellent. Thank you so much for making my day. Light & Blessings. i’ve driven women to run, throw things, curse me out, and several other things – but i’ve never caused a woman to kiss a dog instead of me. i appreciate your kind words, and i’ll try to give you a reason to repeat them. you are a great writer Rich!!! aww shucks. thanks. always kind words. i can take it. and i can dish to too. so just watch yourself there young lady. i can’t. therefore, i can imagine you however i wish. and if i wish – pouf! – you’ve got curly green hair. and if i wish – pouf! – you’re dressed like a ham sandwich. and if i wish – pouf! – you’re crawling to me and begging me for more. and – ow! hey, i didn’t wish to get slapped. oh well. guess even imagination has its drawbacks. but now, after having established another aspect of friendliness, i would know that something sarcastic was just good playfulness. and it’d be fine. and then we’d be out at dinner, and you’d go to the ladies room, and i’d have a bug in my pocket that i’d drop in your wine. and then you’d come back, take a sip, get grossed out. and i’d say, “see. it was just good fun.” there are many firsts. and it’d be the first time someone threw a glass of wine at me. aww. that’s cute. plus, the alcohol would sterilize the bug and make it perfectly edible. i think. oh no. not them. i used to have a house that had lots of lady bugs in the attic in the winter. by lots, i really mean maybe 10 at any given time. not clumped together but in random places. they were kinda neat. nah, never did. they’re cute. love watching their little feet walk back and forth. then when they know there’s nowhere to go, they freeze up, then that back shell opens up, and bzzzzzzz…. holy crap. we’re having this cool conversation in the comments about liberal media. hi everybody. don’t mind us. hey, put your dress back on. think it’ll walk all the way through a straw? what if it’s a young lady bug? would that be a girly bug? i mean what would you call it? i guess the term “lady” transcends age. judging what people do is a very sensitive thing… you might not understand always correctly what they do or why… many see a gesture of a woman kissing a man as a love related thing… there are few people that believe that a woman and a man can be really sincere friends like in childhood… what for you can be a joke(putting a bug in my wine) can be a crime in my eyes… what for you is a logical reaction (considering the types of women you have had in your life) for me is something that would not even pass through my mind… What would tell throwing the wine at you about me? that I’m unbalanced, agressive, impulsive and that I cannot express myself in words? could be. nothing positive i guess, or ladylike. what would it tell you about me that i would suggest you might throw the wine at me? all of the above. but mainly because i like self-effacing humor. the more i put myself down, the more humble it makes me appear. aww. i can’t think of anything worthy to follow that. FB’d this one. You be preachin’ to da’ choir here, but what the heck!